The US Ambassador to Israel revealed on Wednesday three key elements of the long-awaited American Middle East peace plan known as the “deal of the century”, Anadolu has reported. David Friedman, who is a member of the three-man team tasked with formulating the plan, told this week’s American Israel Public Affairs Committee (AIPAC) conference in Washington that the plan would give Israel full security control over the occupied West Bank. Friedman is a strong supporter of Israel’s illegal settlements across the occupied Palestinian territories. He added that the deal will allow Israel to maintain a permanent security presence in the Jordan Valley. “Can we leave this to an administration [in Washington] that may not understand the need for Israel to maintain overriding security control of Judea and Samaria [the West Bank] and a permanent defence position in the Jordan Valley?” he asked. 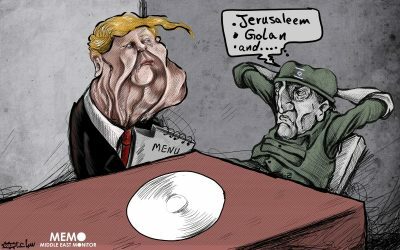 The current administration, he pointed out, would continue to work with Israel, the Palestinians and other regional players in pursuit of a final peace deal. With regard to Jerusalem, Friedman claimed that “For the first time in 2,000 years, Jerusalem has become a dynamic and prosperous city fully open to worshippers of all three faiths.” He ignored the armed incursions by Jewish settlers at the Noble Sanctuary of Al-Aqsa and the frequent lock-outs of Muslims from Al-Aqsa Mosque. Moreover, Palestinians are being driven out of the city by Israel’s apartheid policies which remove their residence rights and allow illegal settlers to take over their homes. International law clearly takes second place to Israel’s security, said observers.